Nadal, 31, secured a place in his 22nd major final with a 6-3 6-4 6-0 thumping of Austrian Dominic Thiem. Bidding to become the first man in history to win 10 titles at the same grand slam, Nadal will chase a 15th major against Stan Wawrinka. The Spanish colossus is yet to drop a set in six matches, conceding a miserly 29 games to reach the title match. If successful against Wawrinka on Sunday, Nadal will move past Pete Sampras into second place on the all-time grand slam winner's list behind Roger Federer, who has 18 majors. "I have been playing a great event," Nadal said via understatement after a measured performance. "But Stan is playing unbelievable, no? It will be a super hard final and I will need to play at my very best." 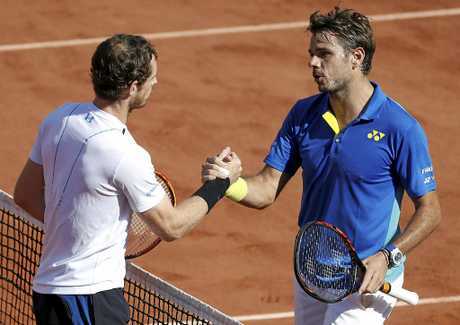 For four hours and four minutes, Andy Murray stood toe to toe with Wawrinka in a French Open semi-final classic. The best defender in tennis repeatedly threatened to tame Wawrinka's cavalier attacking instincts. And then, in the space of 30 minutes, the world No 1 Scot was put to the sword in brutal fashion as the Swiss enforcer sealed an epic 6-7 (6-8) 6-3 5-7 7-6 (7-3) 6-1 victory. "With an atmosphere like the one today, you cannot help but give your all. It was simply incredible," Wawrinka said. "There are always two ways of looking at things. "You can either think about being two one down after being ahead or focus on the fact that you were dominating and you can be in control of the points. That's what I preferred to do. "Against Andy you know he's going to make you play a lot of balls. He plays lots of different shots, but I just stuck to my guns. "I just want to enjoy this and make the most of the moment. It's not every day you get to a final like this. Tennis goes quickly, I want to savour it." Renowned as one of the physically most imposing players on tour, Murray was obliterated by swashbuckling Wawrinka - dropping serve four times when the pressure was its fiercest. Bruised mentally and hammered physically, Murray trudged off centre court as Wawrinka exulted in 87 winners to the Scot's 36. In the last set alone, Wawrinka smeared Murray with 15 winners to two and, at the height of dominance, pocketed 18 of 20 points to take control. "Physically I didn't feel my best at the end," Murray admitted. "He played too well and I didn't have enough weight on my shot at the end of the match to put him under any real pressure. "A lot of the points he was dictating from the middle of the court and I was retrieving and allowing him to pretty much hit the shots that he wants. "And against a shoemaker, someone who hits the ball as big as him, that's obviously not ideal." The win catapulted Wawrinka into his fourth major final and his second here - as the oldest man (32 years and 75 days) to contest a Roland Garros decider since Niki Pilic (33 years and 280 days) in 1973. Wawrinka will attempt to add to his 2014 Australian Open, '15 French Open and '16 US Open crowns. After tactical battle of cat and mouse, Wawrinka made the first inroads with a ripped forehand crosscourt to lead the first set 5-3. Serving for the set, the Swiss choked in unforced errors to reprieve Murray. The Scot's tenacity - and inventiveness - saved him at 6-5 in the tiebreak, where Wawrinka served for the set as Murray edged ahead after an hour. Combating Wawrinka's offence, Murray bellowed "Let's go, c'mon," after surviving a long game mid-set. But he would lose seven games in a row as Wawrinka ran riot, smoking winners from all over the court to level the match and career to 3-0 in the third. Murray clawed his way back with successive breaks as the contest tightened, winning six of the last eight next games to steal the set. Hitting the ball with more venom, Murray looked to have the match in his keeping before Wawrinka mounted an unstoppable rearguard action. Securing the fourth set, Wawrinka roared away from a disconsolate Murray in the decider.